Paul Plumeri mixes covers and originals on his new CD, Live in Seattle. The Paul Plumeri Band plays Conduit in Trenton Feb. 22. On most weekend nights, Paul Plumeri and his Fender Stratocaster are igniting a club somewhere around Central Jersey or southeastern Pennsylvania. Maybe you've caught him at Havana in New Hope, The Tiger's Tale in Montgomery — or possibly Seattle? Mr. Plumeri (pronounced plum-er-rye) has traveled to the Pacific Northwest three times in the recent years for gigs with bass player Monte Thomas and drummer Conrad Ornsby. "I think that if you do the old songs with a new flavor there's always an audience for them," says Paul Plumeri, above. "I'll go out on 10- to 14-day runs and play as many shows as I can within that time," he says. "As much as I like to play with my own band, it's always been easier to just go out there and play. "Seattle is such a great town for music, too. A lot of people are still coming out to hear live music." 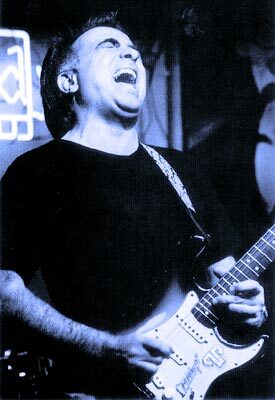 In late summer 2000, the Trenton native was experiencing a lineup shift in his New Jersey-based Paul Plumeri Blues Band, so he took a couple weeks off from his state job and headed west. A musical postcard of the trip, recorded Labor Day weekend at the Paradox Theater, is now available as Mr. Plumeri's first-ever live album, Live in Seattle. He and his regular band will celebrate the release of the effort at Conduit in Trenton Feb. 22, along with former band member Levon Helm and his group The Barn Burners, as well as The Matt Angus Thing. Getting the self-produced CD on the market has taken nearly a year and a half of long-distance work with bass player Monte Thomas, who handled the live recording, and Thomas' wife, a graphic artist who designed the packaging. "The whole thing was going back and forth from West to East coast," Mr. Plumeri says. "You're not all there together at the same time so you're doing things by phone and e-mail. "I really owe a lot to them for the making of this. They took a lot of stress away from me, I can tell you that." The 47-year-old Mr. Plumeri, known as "The Bishop of the Blues" for his fiery, economical playing and gravelly vocals, has recorded just a handful of albums during a 30-year career, because, he knows, the blues work best in smoky, raucous bars, not antiseptic studios. "Interaction with the audience is such an essential part of the whole thing," he says, "so I figured, why not give people a taste of what that live thing sounds like." Live in Seattle captures Mr. Plumeri having fun with the music he loves, as evidenced by the lead track, a rollicking medley of "Let the Good Times Roll" and "Everyday I Have The Blues," and by originals such as "Cross-cut Saw" and "Like a Bullet," both from his 1996 CD, The Bishop of the Blues. 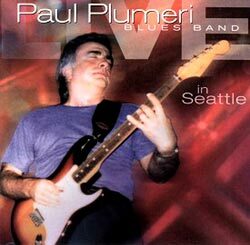 Mr. Plumeri's first-ever live album, Live in Seattle, was recorded Labor Day weekend at the Paradox Theater. The new disc concludes with a scathing version of Jimi Hendrix's "Hey Joe," a frequently requested rock oldie he's happy to play. "I think that if you do the old songs with a new flavor there's always an audience for them," Mr. Plumeri says. "With Hendrix, people still love to hear anything by him. I've never been much for really copying any version, anyway, so I'll kind of put a twist on it and it makes it sound brand new again." Mr. Plumeri, who lives in Hamilton, hopes the Conduit can spark a rebirth in the Trenton club scene that was thriving when he got his start in the late '60s and early '70s. "The places that are having it are well and good," he says. "I'd just like to see more of them. In Trenton, for instance, there are very few places to play anymore." Strict DUI laws enacted in the early 1980s contributed to the decline, he says, but so did a cultural shift away from live music. "There used to be dances and talent shows that gave entertainers starting out places to hone their craft," Mr. Plumeri says. "Even a high school dance was an outlet. You got to practice, you got paid and you got to present material. I don't know if they even have bands at dances anymore, or if they have dances at all." The lack of live music venues is something his 19-year-old son, Paul Plumeri Jr., is encountering. The younger Plumeri is a "very good guitarist starting out," but Dad says junior and his friends have it tougher than he did. "Sometimes they'll rent a hall and have some type of show, but for those guys, that's few and far between," he says. "It just isn't as happening as it was back 25 or 30 years ago."